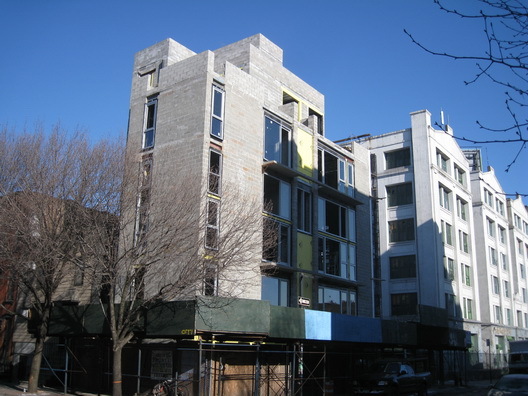 There was a long time when we wondered if 99 Havemeyer in Williamsburg, which is at the corner of Hope Street, would ever exist because progress on the site was so slow it made one of developer Shaya Boymelgreen’s projects look like it was progressing at the speed of light. Yet, here it is. It will have 6 units and it’s could be another one of a dying breed: a building from Robert Scarano, the King of the Brooklyn Architects. We were going to say, boy, this one was going well…but….uh….we found a partial Stop Work Order slapped on the building on February 18 for “WORK W/O PERMIT. SCAFFOLD ERECTED GREATER THAN 40 FEET.STOP ALL WORK ON SUPPORTED SCAFFOLD OBTAIN PERMIT.” Oh, these Scarano projects, always getting slapped around. Someday, it will all be viewed as petty harassment of Brooklyn’s visionary equivalent Frank Lloyd Wright. Don’t laugh. You never know what they’ll say in 50 years. In 50 years or so people will think it is quaint and should be landmarked. Glad I won’t be around then. Frank LLoyd Wrong is more like it. There is a difference between pushing the envelope and deliberately doing things illegally…Mezzanine anyone? Robert, Ever hear of the financial crisis? Maybe that’s why it is taking so long or could it be the DOB crazy people. Bulding massing and window patterns look way cooler than the prison next door asswipe.